Strange but true (well almost). Amongst the self-styled revolutionary left there are those who have given more or less unconditional support to the political and military operations of the Islamic State. They consider it to be the only force that has the courage to fight imperialism (of course mainly American), therefore it is the only source of inspiration for the international class struggle. They seem to forget that the Islamic state is a tool in the struggle between the various imperialisms on Syrian soil, and is itself one of the pawns in this no-holds barred game. This same "Left" has gone in for much more obvious alignments, as in the case of its support for Putin's Russia and its ally Assad, as if imperialism and its wars are just the fault of the Western American-led axis, and do not also spring from Russian imperatives. They thus fall into the double error of supporting one imperialism against another and this prevents then from being consistently against war and imperialist as a whole. It is this kind of one-sided anti-imperialism that has produced enormous political damage which we have always denounced. Elsewhere (Prometeo N° 12-2014 and 14-2015) we went into the reasons for the present inter-imperialist conflict in Iraq and Syria, explaining the way the various forces lined up. Within that framework, we explained how one of the many anti-Assad groups was allowed to flourish. The new Sunni caliphate now stands as the focal point of a new imperialism in the area, as a bulwark of Middle Eastern interests against the arrogance of Christian and Western imperialism. We explained its origins in Iraq, and its annexationist tendencies in Syria. We tied the threads that linked the ambitions of al Baghdadi (head of IS) to American and Saudi Arabian loans from the start. They manoeuvered IS into an anti-Bashar al Assad posture, as part of the renewed Cold War game between Russia, the United States and small imperialisms of the Mediterranean area in the struggle for supremacy over the usual strategic prizes like oil, and control of the oil trade. That IS subsequently got out of their control and started the construction of its Caliphate thanks to the funding it had previously received, as well as revenue from Syrian and Iraqi oil wells it had in the meantime conquered, is another story. Just as the creation of two coalitions against al Baghdadi, one American-led, the other Saudi-led, not to mention the military intervention of Iran or the increased role of Russia and the “ambiguity” of Turkey and Qatar are all part of another story. In this context of international crisis, where all the major imperialist powers are involved in the war against IS, the fight with the Caliphate is actually just the screen behind which the interests of Russia, USA, Iran, France and Italy (more in the Libyan theatre), England and Germany clash. All of them are prepared to intervene or allow the use of their air bases. They all share a false unity. Superficially it looks like a conflict between East and West, but it is also West against West (Russia against USA and Italy against France). It is equally East against East, Sunnis against Shiites but also Sunnis against Sunnis (Saudi Arabia against Qatar, or Saudi Arabia opposed to Turkey), depending on the specific interests of the imperialist party, even if within the same line-up. With the exception of Japan and China, all other imperialist powers are in a sort of "mini-World War" in search of an equally miniscule way out of the crisis. In the meantime though, they seek to redistribute spheres of influence either by attempting to hamper their competitors financially, or through control of oil regions as well as the trade in the black gold. Those false tacticians of the “Left” who, in the name of a fake anti-imperialism support the Russian-Iranian-Hezbollah axis, not only do not understand anything about the current crisis and the imperialist dynamics which it has unleashed, but see "their" way out of the crisis only in terms of violence, barbarism, death and devastation. They thus renounce, a priori, any thought of opposition to war, to the crises that produce wars, or any thought that capitalism is the root cause of all this. This self-styled Left functions to preserve the system and brackets itself with the most ferocious representatives of both the old and new imperialisms. They never even think about the need for a revival of the class struggle, and are blind to the fact that it is the proletarian masses of the unemployed and the desperate who serve as cannon fodder in the same old imperialist games. After this necessary summary for those who have not read our previous articles, we now come to the class composition of the Islamic State. Although it started as a subsidiary of Al Qaeda in 2006, three years after the US intervention in Iraq, and after the death of al-Zarqawi, IS was only properly formed in 2011, with the outbreak of the civil war in Syria and the related indirect confrontation between Russia and the US over Assad’s future. At first it was led by Abu Ayyub al-Masri but later by Abu Bakr al Baghdadi. Its aim was to bring down the Syrian Alawite regime and create the territorial and economic foundations of the new Baghdad Caliphate through substantial funding from the US, Saudi Arabia and Qatar, in their different and conflicting strategic aims. The common goal was to get rid of the Alawite enemy but behind that lay the struggle for leadership of the Sunni camp. This would increase the possibility for investment of petrodollars in the Middle East and, not least, give them a free hand in the strategic control of one of the most sensitive areas of the world. From the start the process of regrouping around the original jihadi nucleus, on which the social and military structure of the Islamic state was to be built, was carried out by the remains of that Sunni state bourgeoisie which had politically and economically lived at the court of Saddam Hussein. After the conflict between US imperialism (then oil-hungry and frightened by the possibility that the dollar would lose further ground against the euro and other international currencies) and Saddam's Iraq, which threatened to divert its oil to other shores and to sell it in Euros, all the old Sunni ruling class was replaced by Shiites. They were completely shut out of the economic, political, and administrative set-up of the new government from the start, as Washington intended in order to bolster its interests in Mesopotamia. It was, therefore, under the pressure of Sunni révanchism, that the first groups of IS fighters joined with a branch of the old state bourgeoisie in the shape of Saddam’s former generals hoping for revenge. The latter gave a professional military outlook to al Baghdadi’s nascent army. Before money arrived from the generous Western and Middle Eastern imperialists and before the oil wells in Iraq and Syria were conquered, IS financial needs were covered, at least in part, by senior members of the Sunni Iraqi bourgeoisie. This state and bureaucratic bourgeoisie, which had been able to live comfortably thanks to large oil revenues, was deeply rooted in the nerve centres of the former Iraqi state. Individuals came from amongst the parasitic managers of oil assets, who had enjoyed the rich benefits of oil revenues, and from directors of state enterprises, but also from rich traders, senior military cadres and civil servants. The core of this leadership, the mainstay and inspiration of Sunni jihadism although originally of a secular nature, now dresses itself in the black cloak of fundamentalism “devoted” to the holy Sunna. For the bourgeoisie there are no religious scruples. They have long practised the art of the chameleon. The only important aim is to regain power. The base of the IS pyramid is made up of the usual desperate people, proletarians and lumpens, peasants and unemployed who against their own interests support the former Ba’athists, a section of the Iraqi bourgeoisie completely excluded from political power. This rank and file has been called upon to fight, to kill and to die to restore its class enemy to power. These fighters are the socially dispossessed and politically disenfranchised who have no anti-capitalist or class-oriented demands. They have become ideologically malleable to any national-bourgeois point of view whether Baathist or jihadist, according to the most appropriate tactics of the moment. These masses have had to be ready to put themselves at the service of the same old bourgeois strategies. This operation is all the easier the greater the political disorientation of the masses themselves. So the despair brought about by hunger and the civil war was expressed in anger and radicalisation which soon submitted to the perverse charms of Islamisation. All this has been dramatically combined in a highly explosive mixture. It’s no accident that the spiritual leader, al Baghdadi, the leader who appeals to the masses, obviously a Sunni believer and a graduate in theology, is himself a man of faith. He is thus the leader that Allah has chosen for the "holy" revival of Islam against the corrupt and corrupting West, against apostates and false Muslims who are condemned to the same fate. It is also no accident that the Caliph's army commanders are Sunni, although laymen, and all come from the Iraqi army destroyed by the US invasion in 2003. Above all stands the figure of the Duri, supreme head of the dictator's troops, the regime’s number two and, at the same time, a general of the army corps as well as a wealthy speculator. The story goes that the Duri recently died during a US air raid. Just like another senior military official of the Caliphate, Ali Mohammed Nasser al-Obeidi, one of the leaders of the old Republican Guard, the special body created for the personal defence of Saddam Hussein, was also eliminated. This in brief is the class composition of the Islamic state, which forms the nucleus of the Caliphate. At the centre is the revanchism of the Sunni bourgeoisie, former administrators of the oil revenues in Saddam Hussein’s time, with the participation of senior members of the previous state administration and wealthy entrepreneurs. Alongside is the armed wing, whose military command is in the hands of the generals linked to the old regime. At the bottom, as always, we find the desperation of the oppressed. Everything is cloaked in "holy war" under the charismatic figure of al Baghdadi who submits everything to the supreme interests of jihadism, from the differences with the Shia to all other social contradictions including the class struggle. Although similar in many ways, the European context (Belgium, Holland and Britain, and especially France with which we are concerned here), has several peculiarities when we look at those who have abandoned their own countries to rush to “Siraq” to fight under the banner of the Islamic State. According to the "enquiry" of the French analysts who made a detailed study of the phenomenon in France, but which may also be repeated in other countries of the old continent, 90% of the fighters are of North African origin. They are aged between 20 and 40 years old, come from the periphery of the big cities, especially Paris, and live in so-called ZUS (Sensitive Urban Zones), modern, often poor, ghettos which are the scene of clashes between young people and special police bodies created specifically to deal with the anger of the young "banlieusards". The story that led to today's events is long and controversial. We can, however, point to a history of failure of economic and social integration, and the collapse of social and political hope. This has been mainly brought about by the self-styled left, which has increasingly operated on a nationalist agenda, as in its defence of the interests of the national capital. It have been very careful never to go beyond the increasingly restricted compatibility the system allows, insensible even in a reformist sense to any economic demands, which might favour the proletariat in general, or immigrants in particular. And from at least the early nineties there has been a process of alienation of the young migrant proletariat of the second, third, or even fourth generation. This is yet another betrayal by a Left that for many decades has no longer been an alternative to capitalist society. Openly anti-communist, increasingly close to the system’s survival needs, it has become, in effect, the best "bulwark" against any shock from the producing class, complete with an increased racism, which is never admitted but always practised. This is all the more true of the riots in the suburbs orchestrated by young "banlieusards". Even the struggles of precarious workers, of students, and the movements of the so-called far left who fought in democratic terms against the war in Iraq without understanding the imperialist nature of the conflict, have ignored this social reality. This has only widened the gap between them, preventing unity among workers and the possibility of the revival of the class struggle against capitalism, its wars and its savagery. On the other hand, such a step was simply impossible, as that "left" could not possibly take on such a perspective since by its very nature it is in fact on the opposite side. The separation between the proletariat of French and of immigrant origin, and the supposed left, it would be better to say between the first two and the absolute vacuum in political terms and revolutionary perspectives of the latter, led to the revolt of the banlieues in autumn 2005, after the death of two boys of North African origin, in St. Denis, a suburb of Paris. This revolt ended in a limited and sterile street clash between the Special Police Units and the despairing "banlieusards". At a different time and with different aims the same episode could have led to very different perspectives of struggle. Instead the "banlieusards" were exhausted chasing up a blind alley. Afterwards they moved towards radical jihadism against all and sundry, including moderate Islamists (like the Muslim Brotherhood). We should also note that the young proletariat in the French suburbs are not so close to traditional Islam, in the moderate form practised by their families, except in a casual and very "secular" sense. So the “irresistible” call of the jihadism of the Islamic State had to have other causes. First of all was the rejection of the economic and social system that had discriminated against them. Then, with the explosion of the international economic crisis in 2007 they faced further attacks on living conditions. All this has indeed led them to be radicalised in a previously unheard of way. Now they face the prospect of dying in the wars into which they have been dragged. The same applies to the collapse of the "myth" of socialism, i.e. of state capitalism posing as communism. This was highlighted by Red Army aggression in Afghanistan in the last spasms of Soviet imperialism as well as the repression of the secessionist ambitions of Islamic Chechnya in the post-Soviet phase. The failure of the other two ways could only point towards a third one. Rejecting the experience of the (fake) Western democracies, however, especially because of their criminal colonialist past, and an equally false communism, "necessarily" only led back to a search for the "true" word into which to channel their accumulated anger. This explains how the Islamic State can present itself as an alternative to the current situation of perpetual economic crisis. There is no real prospect of the system responding to the youthful proletariat of the banlieues urgent need for employment. However, no-one expected that young people coming from the social breakdown of a petty bourgeoisie in the process of proletarianisation would also be dramatically dragged into jihadism. To complete the picture there is also the disillusion that of many of the participants in the risings of 2011. With hindsight many young proletarians of North African and the Middle East have rejected the political outcomes of the movements which they had idealistically hoped would drastically change things. However the Arab Spring not only failed to change things for the better, often it has ended in dictatorships which are even worse than before. Hence the result is the rejection of the risings of 2011 and, unfortunately, the beginning of the path to the illusory "third way". Once entered this is like a tunnel which forces you towards absolutely paranoid jihadism. At this point, let’s remind those who support the alleged anti-imperialism of the Islamic State about what is being done in Syria and Iraq, by both small and big imperialist powers as well as this so-called IS which is part of the imperialist barbarism of decadent capitalism. It tries to survive by opening up new theatres of war in armed conflicts fought for nationalistic ambitions. All of this against the interests of millions of the exploited in what they want us to believe is a "just" war of "divine redemption" but is really an attempt to create a state and to regain control of the oil which is the driving force behind it all. All under the watchful guidance of Allah who makes all things possible if you fight in his name. Unbelievable perhaps, but in the present historical period in those political latitudes, given the absence of any revolutionary alternative to the crisis of the capitalist system and its savage wars and violence of all against all, even the incredible becomes possible. 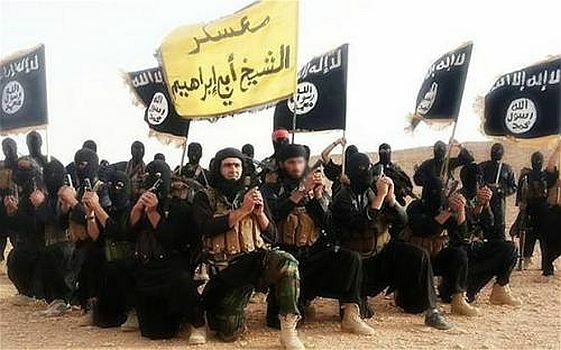 In addition, it should be emphasised that in political programmes, in the daily practices of the IS militants, like any other jihadist organisation, fighting atheist and thus satanic communism, is the number one enemy if only it existed on the domestic political scene. Communism is a danger to jihadism because it is against any capitalist and nationalist bourgeois scheme, however it is dressed up. This is also because it is against imperialism and its disastrous wars, including that of the Islamic state itself. And also because it would draw away the mass of the dispossessed who today, are ideologically dominated by religion in fundamentalist guise. They would then be oriented on the terrain of class struggle breaking bourgeois nationalist and ideologically religious schemes, which for the moment still work as a social narcotic and an antidote to class confrontation. For the moment, the enemies who fight over territories and oil are Shiites and Sunnis but if the class struggle begins to show signs of revival, the ferocious machinery of jihadism will be ready to unleash all its reactionary and conservative fury against it. As we have seen, the Islamic State (then still Isis) was born in Iraq during the American occupation in 2003, as the Iraqi offshoot of al Qaeda, under the leadership of al-Zarqawi until his death in 2006. Then from 2010, under the leadership of Abu Bakr al Baghdadi, things begin to change, creating the conditions for a definitive split. The rupture between al Qaeda and IS developed in the Syrian Civil War (spring of 2013) where the internal struggle for political and military leadership within the forces of opposition to Bashar el Assad’s Alawite government took on a more radical tone, in some cases even including armed conflict. IS clashed with the Syrian Qaedists of the Jabhat al Nusra Front, Shiite groups and even the instructions of Ayman al Zawahiri himself, after he took over the leadership of al Qaeda on the death of Bin Laden. Zawahiri could not accept al Baghdadi’s rise to become head of Sunni jihadism, operating autonomously in Syria and employing such a violent form of a terrorism that it risked giving a negative image of Al Qaedi’s own groups. For this al-Baghdadi was ordered to return to Iraq as a national section of al Qaeda and await orders. IS however, not only failed to withdraw, but went up the Euphrates to the banks of the Orontes River in northwest Syria. In Iraq it entered Anbar province, and laid siege to the cities of Fallujah and Ramadi before going on to Raqqa to conquer a territory the size of Belgium straddling both Syria and Iraq. But beyond simple "disobedience", this rupture had very different motives both political and strategic. The aspiring creator of the new Caliphate rebuked al Qaeda that it was simply a military operation responding to Western imperialist manoeuvres with exemplary acts of more or less effective terrorism, but with no real strategy. It was bound up with old methods of struggle and propaganda, and was tactically out-of-date without a viable strategy for the short or, above all, the longer term. This deep rupture made al Baghdadi the only representative of the jihadist world, its religious and political leader. He was now the bearer, not just of the will of Allah, but also the economic and political interests of Sunni révanchism for oil in a mystical guise. 1) He built up an area that would serve as geographical, legal and administrative launchpad for the new state. Instead of the old nationalisms who compromised with Western imperialism, and are thus possible victims of the new ummah, we have a new nationalism for a future Islamic society which does not just attack "infidels" but also “false Muslims”. 2) He created the economic conditions to support the state structures of the Caliphate. This was mainly through controlling oil, the sale of which pays for the state bureaucracy and the militias. However IS also received finance with the complicity of countries such as Qatar, Kuwait and Saudi Arabia itself. 3) He established a small welfare state able to meet the most immediate social problems such as health, education as well as the inevitable judiciary to implement rigid sharia laws. 4) He imposed a "revolutionary tax" on all economic activities, ranging from bigger businesses to small artisanal workshops. There are also taxes on trade and on the self-employed, such as doctors and other professionals. 5) A special mention must be made about the organisation of the army. The Islamic State has from the outset paid particular attention to this problem. Having solved the first two problems (winning a territory and running the oil wells), it was inevitable that making its troops "safe" in terms of reliability and dedication to the cause would be next. Either through a religious sales pitch based on the "revolutionary" perspective of a new world willed by Allah, or by using the threat that desertion risked a traitor’s reward of the most excruciating and certain death possible. But they mainly rely on the economic situation of the fighters wherever they come from. Only 30% are of Syrian or Iraqi origin. The remaining 70% come from Tunisia, Morocco, Chad, Nigeria and other countries of the Sahel. In short they come from the poorest areas of the centre-north of the African continent, not always Islamic but very interested in steady pay allowing them to meet their own needs as well as those of their families back home. The Islamic State pays its fighters $800 a month, plus a range of benefits, including the occasional use of a car, a cell phone and a sort of pension to families in the event of death. Not much when compared to the advantages of Western contractors, but a lot for anyone coming from the most socially underprivileged lands of the continent. Having said that, don’t think that the Islamic State is an unstoppable force carrying out its programme at will. As we have already said, the initial success of ISIS was possible thanks to financial support and the supply of weapons by Saudi Arabia, Qatar, Turkey and the United States who initially played the ISIS card as part of the anti-Assad game. Then, when al Baghdadi felt that it was time to break away from his "protectors" to play his own game, thanks to the conquered territories and oil in them, things changed a bit. The picture was further complicated by Russia’s intervention to defend its ally Assad. In response the US created a Coalition against the Islamic State; Saudi Arabia, although part of the American-led Coalition, a few months later did the same with its Arab allies. All apparently against an IS, which is now less useful but in reality it is all against all to satisfy their imperialist interests in the world’s most "sensitive" areas. This has allowed the Islamic state itself to carve out its own zone of operations thanks to discreet allies, such as Turkey and Saudi Arabia, which means it can survive in spite of the (not very determined) opposition of the other imperialist players. As previously mentioned, the Russian presence, before and after the "ceasefire" agreement with the US, has the objective of military weakening Assad's opponents. The US uses its Coalition to do exactly the opposite of Moscow, that is, eliminate Assad from the Middle East and Mediterranean political scene. Turkey’s main aim if Syria is dismembered, is to get hold of the Kurdish area which would allow it to annex a strategically important area and prevent the birth of a second Kurdish state (after Iraq's Barzani) in one fell swoop. The Ankara government is also using the "war" against the Islamic State to oppose both the Syrian and domestic Kurds of the PKK. The current conclusion is that IS, despite the increasing difficulties and defeats on the field that saw it retreat from the offensive of the official government of Damascus, can survive. However its survival will be increasingly linked to how the balance of this imperialist conflict in the heart of the Middle East ends up, if indeed it ever does end, or whether the conflict will be forced to widen still further. Meanwhile IS benefits from aid that still "illegally" reaches Raqqa to guarantee its survival. It comes from Turkey, Saudi Arabia and Qatar, although they are part of two coalitions against IS. However, it is suffering from the opposition of some Coalition members whose policy of containment severely affects the price of crude oil in particular. The result is the loss of funding sources for what little they have set up in the newborn “Siraq”. It is also suffering from the determination of Russia and the consequent partial loss of territories to Assad's control. In reaction to its current weakness, the IS either acting alone or in collaboration with allied groups, is more and more often carrying out terrorist acts of terrorism abroad in order to fuel the sense of its invincibility among the Arab masses and to show that it has the power to take action whenever it wants. The transfer of a couple of thousand fighters of the Islamic State to Sirte, assisted by flights in Turkish government planes, was intended to play a part in the expected tripartite division of Libya. This appears to be a desperate attempt to stay afloat in the stormy waters of a sea in which it can no longer sail, rather than a real economic and military expedition aimed at territorial expansion. As always, everything is in the hands of the big imperialist powers. Their conflicts inevitably produce the collateral effects which decide the fate of smaller imperialist powers and, even more, the fate of those who have yet to become imperialist, however ferocious and determined. a) The supposed socialism of the USSR never existed, except in the programme and hopes of the Bolshevik Party. These were first modified and then destroyed through isolation from other international revolutionary experiences and Russia’s domestic economic backwardness. Stalinism was in fact the final organisational and economic “form" of the counter-revolution in Russia. The dictatorship of the proletariat was replaced by that of the party and that of the party by the personal dictatorship of Stalin, after a fierce internal power struggle with personal rivals, or in political terms against those who accused him of building state capitalism in the guise of socialism. The massacre of Stalin’s victims and the substitution of the idea of socialism in one country for proletarian internationalism completely destroyed it as the only solution to the problems and expectations of the international proletariat. Stalinism encouraged the other revolutionary experiences which took place to give up everything in a few short years in order to create a cordon sanitaire around revolutionary Russia, so the USSR could build "its" domestic “socialism”. Revolutionary internationalism became reformist nationalism. Instead of encouraging the extension of the dictatorship of the proletariat elsewhere the Comintern came up with the United Front and supported workers’ and peasants’ governments that had nothing to do with a proper revolutionary programme. The urgent necessity for the economic experiment of the NEP reopened the mechanisms of the capitalist market (Lenin said it was needed to allow a minimal development of the productive forces, otherwise all Russia would die of hunger, whilst holding on to power, waiting for the international revolution to come to the rescue), gave way to the first experiments of the Five Year Plans and state capitalism. The Second World War, completed the counterrevolutionary course of Soviet Union ranks when it definitely became one of the opposing imperialist camps. It was now more than ever obvious that there was no socialism to defend. The only thing to do was to denounce how the October revolution had ended up and the trap that both the Russian and international proletariat had fallen into in both their heads and in their political consciousness. But even this had not been true, communist practice would have required not the defence of Russia, but an extra effort to open other revolutionary fronts which defended the first revolutionary class experience. b) Today this misconception is no longer possible: apart from the farce of the People's Republic of North Korea, there is no country in the world that can even fraudulently claim to be a socialist country. This means communists everywhere should work for a revolutionary solution to revive the programme and the consciousness of the politically advanced proletariat at an international level. We have nothing to do with so-called communists whose support for one imperialist cause against another makes no sense. They never escape from the capitalist logic that produces these wars thus abandoning on principle any vision of the revolutionary revival of the class struggle. c) The same goes for the defence-support of the various nationalisms in the region, and especially that of the Kurds. To support the Rojava movement in Syria (in this regard see Prometeo No 12, series VII, 2014), the PKK in Turkey like any other national-bourgeois aspiration of the Kurdish diaspora, seeks the same model of social and economic organisation as that of Massoud Barzani in Iraqi Kurdistan. The latter is supported by the United States as a primary source for the supply of Iraqi oil which the former regime of Saddam Hussein no longer guaranteed. The Shiite regime of Nuri al-Maliki could also not guarantee supplies. The result therefore is a Kurdish capitalist state ruled by a parasitic bourgeoisie living lavishly on oil revenues, whilst the rest of the population wallow in poverty. In addition, the bond of allegiance with the US means that efforts to participate in the ongoing war are required even if it’s not in a leading role or with much fanfare. The Kurdish bourgeoisie is like all bourgeoisies, and seeks to defend its economic interests through the involvement of its proletariat in the “nation”. It is a well-tried bourgeois practice. Another aspect is that those "leftists" confuse people’s struggle with class struggle; self-determination of nations with class emancipation. They fight against dictatorships, but not against the economic system that sustains them, against the political superstructure but not against the relations of production. They will however defend these dictators if they are attacked by American imperialism, the only one they recognise as they are incapable of understanding today’s context of global imperialism. The crisis of imperialism has shaped fronts, identified the vital areas for regional conflicts, and enacted shifting and opportunist alliances. Whilst these all demonstrate the fluctuating features of a global capitalism in search of impossible solutions, our gentlemen of this same old "left" find nothing better to do than choose between the conflicting imperialisms. They oppose aggression verbally but, if anything, they act as an integral part of the war from an ideological point of view. Capitalist barbarism is never mentioned let alone denounced in their outmoded ideological schemes. They talk of one side being more progressive than another, of the need for "radical decisions" to safeguard peoples within existing conflicts, but they never pose the real question which responds to a single imperative. Only the class struggle, independent of any bourgeois or imperialist conditioning can be effective against war. Any schema which involves taking side has to be abandoned. Otherwise you enter into the logic of war itself. The only war possible for the international proletariat is the "war on war" against imperialism, against capitalism and its crises which provoke and exacerbate it. Against the idea of choosing one side in support of an impossible “peoples’” solution we must pose the need for a social alternative. We are in the middle of the deepest crisis of world capitalism. It has produced tens of millions of unemployed people in Europe alone, and hundreds of millions throughout the world, including China and India. It has displaced millions of hungry and terrified refugees escaping the killings in a tragic exodus of biblical proportions. It is as if the various factions were already staging a "world war". The slogan cannot be to support Russia against the United States, or Assad against Turkey. With IS if it fights against Western imperialism or against it if the army of al Baghdadi teams up with the West. You do not choose an imperialism because it is better, more "progressive" or not as bad as the others. Nor do we take sides tactically with one combatant rather than another on the basis of the alleged defence of popular interests or oppressed peoples. The only possible answer is the effort to create an international class front that begins to raise the issue of anti-capitalism, of the proletarian revolution which is the only way to achieve the emancipation of the working class and the emancipation of humanity. This applies to workers in Aleppo as it does to those in Ankara, as well as for those in Europe and America. Otherwise we will have capitalist barbarism for ever. Abu Musad al-Zarqawi – Al Qaeda leader in Iraq who targeted Shia. Killed by a US bombing strike 7 June 2006. The ummah means community as in a community of believers who will achieve salvation together. IS Salafism defines this more narrowly than was common in the past so that many (if not most) Muslims are not part of their ummah. Following such an impressive detailed article, maybe it should also be remembered that any capitalist business needs orders for its products. If a present need for them doesn't seem to exist, then supposed needs for the near and more distant futures can be provoked to gain future orders. That seems to be particularly relevant to causal interconnections between manufacturers of weapons, ammunition and military vehicles, and so on, with all the ideological causes explained in the article.